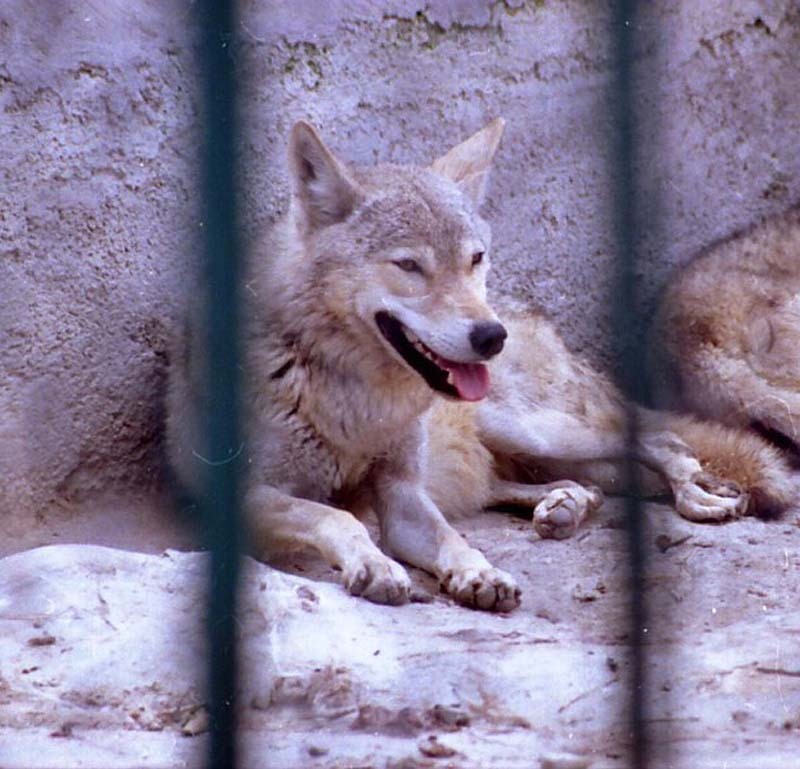 This is an Iranian Wolf (GORG in Farsi) In Tehran Zoo. The Iranian wolf (Canis lupus pallipes), prominently featured in popular literature such as Richard Kipling's, The Jungle Book, once ranged from the Middle East across Asia. This beautiful and unique animal is also referred to as the Indian or Asiatic wolf. A subspecies of the gray wolf, the Iranian is smaller than its counterparts in Northern Europe and America. Standing 18 to 30 inches tall at the shoulder, Iranian wolves weigh between 55 to 70 pounds. The short, pale color of their fur helps them to blend into the semi-arid landscape that they call home. Little or no undercoat keeps them cool in the hot climate of the Middle East. Despite the differences that exist among different populations of Iranian wolves, they are unique from other subspecies of the gray wolf in their overall small body size, light pelage, habit of hunting small animals, and the fact that they apparently seldom howl. Iranian wolves prey on a variety of small mammals including hares, mongooses, rats, squirrels, and ground birds such as partridges, quails, jungle fowl and lapwings. Originally the range of Canis lupus pallipes extended across the Indian subcontinent and included parts of Israel, Iran, Turkey, and India. No good estimates exist as to how many wolves might have lived in the Middle East prior to the early 1900's. However, researchers are certain that their numbers have decreased dramatically over the last century. Due to the fact that the range of Canis lupus pallipes covers several countries, it has been difficult to determine the number of wild wolves still alive. India is home to approximately 400 wolves, Israel 200-300, and even fewer in Iran and Turkey. Small populations of Iranian wolves might still exist across the Indian subcontinent. Iranian wolves inhabit a variety of terrain, from arid desert landscapes to richer scrub forests. As a result, there are many physical and behavioral differences among individual populations of Iranian wolves. Wolves living in drier, harsher climates show adaptations to their environment such as their small body size, hunting individually or in pairs, and the habit of eating rotting fruits to quench their thirst. Iranian wolf populations living in less harsh climates have larger prey available to hunt and as a result are slightly larger, and hunt in bigger packs. Just a question :why did U name it "bad" wolf ?